The problems of peacekeeping in Somalia, Rwanda and former Yugoslavia marked a turning point for major powers in international military peacekeeping. Major support for a more pro-active UN role in peacekeeping has not been forthcoming and where major power involvement is deemed vital, non-UN peace operations have increasingly become the norm. This valuable volume explores the continuing significance of peacekeeping in international affairs, particularly in terms of its military dimensions, and examines the priorities and perspectives of the major powers in relation to their military participation in international peacekeeping and wider peace operations in the twenty-first century. It is ideal for scholars and students interested in contemporary international politics, international relations, international organizations, security and strategic studies, conflict resolution and foreign policy analysis. Contents: Introduction, Owen A. Hartley and Rachel E. Utley. Major Power Perspectives: US Peace operations: the transition continues, Edward M. Spiers; Integration or retrenchment? Russian approaches to peacekeeping, Isabelle Facon; Amritsar to Basra: the influence of counter-insurgency upon the British perspective of peacekeeping, Richard P. Cousens, OBE; A means to wider ends? 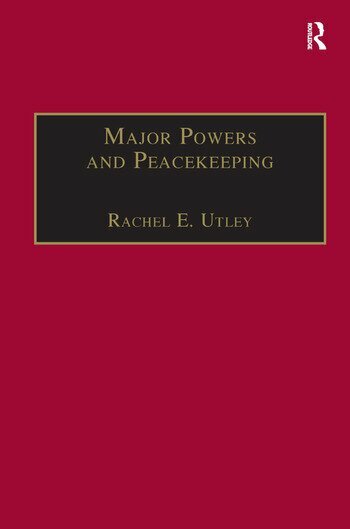 France, Germany and peacekeeping, Rachel E. Utley; May you live in interesting times: China, Japan and peacekeeping, Gary D. Rawnsley. Peacekeeping In Practice: Peacekeeping in Africa, David J. Francis; Peacekeeping in Asia: lessons learned from Afghanistan, Cambodia and Timor-Leste, Alpaslan Ã–zerdem; Peacekeeping in the Middle East, Ali Ansari; The media, conflict and peacekeeping, Philip M. Taylor; Conclusion, Rachel E. Utley; Appendix: peacekeeping in the UN Charter, Index. Rachel E. Utley is Lecturer in International History in the School of History, University of Leeds, UK.